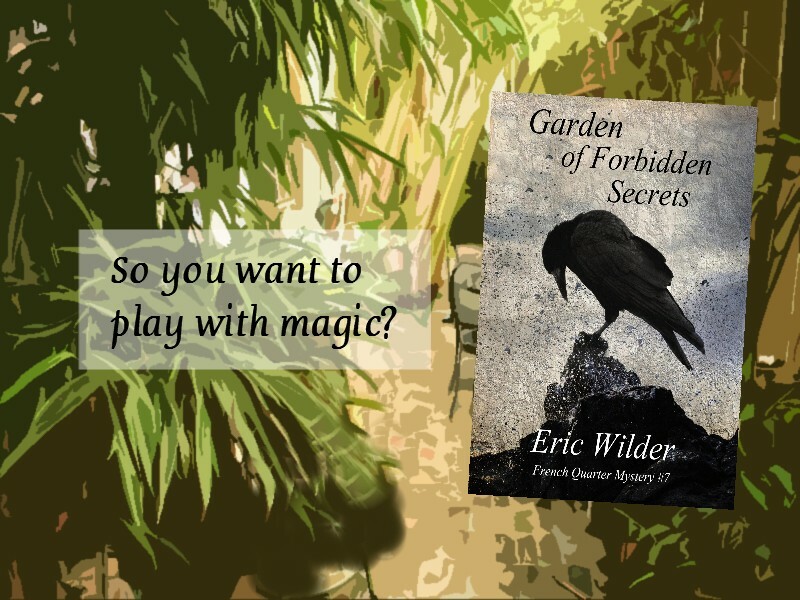 My new book is titled Garden of Forbidden Secrets. 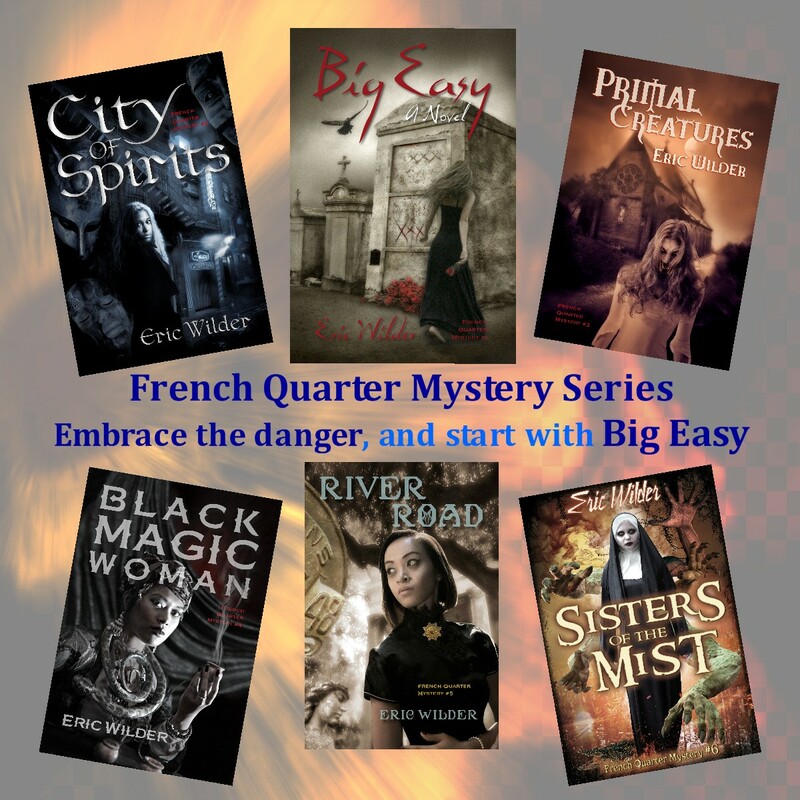 It's Book 7 of my French Quarter Mystery Series and is set in New Orleans. I always enjoy writing about New Orleans and this book is no exception. I’m also a huge basketball fan and enjoyed creating Taj Davis, my veteran NBAer, for this book. If you read my last book Sisters of the Mist then you’ll remember I left Eddie Toledo dangling in the breeze. I’ve resolved his dilemma in this book and I’m seriously thinking about spinning off Eddie into a new series. After you read Garden of Forbidden Desires I would love to hear your reactions and thoughts. The book isn’t yet available for pre-order on Amazon until December 1. Right now it's available in Nook, iBooks, Kobo, and Smashwords. Thanks for your support and I hope you love the book when it comes out on March 1, 2019. Though only thirty-three years old, Taj Davis was ancient by NBA standards. His surgically repaired left knee still ached whenever he ran or jumped. Arthritis had begun affecting his fingers although no one had yet noticed the knots deforming the digits of his shooting hand. As he followed a bellman down the hallway of a New Orleans hotel, he felt every year of his young age. Taj had hoped to play in Cleveland during his final years in the league. An early morning call from an assistant coach had informed him his dream was not to be. He’d had about three hours to pack his apartment before taking a taxi to the airport and flying to New Orleans, the NBA city that had acquired him in an unexpected mid-season trade. The bellman stopped in front of a door and opened it with a key, the odor of must and age accosting Taj’s senses as he followed the little man into the room. The bellman, dressed in a red velvet coat, sat the suitcase on the bed and smiled as he palmed the twenty Taj had handed him. “Why in the world did the Pels trade their best player?” Taj asked. The curtains on the large room’s windows were open. Taj nodded as he glanced out at the flashing neon of the French Quarter and running lights of boats out on the river. “The chef makes the best gumbo in town,” Tommy said. “Hope you’re right about me spending some time here. This is my third team in the past five years. I was hoping to play my final season in Cleveland. Tell you the truth, I’ve never eaten gumbo,” Taj said. “If you say so,” Taj said. “Maybe the evil spirits hanging around every corner,” Tommy said. “How long has that been?” Taj asked. “Because someone was murdered here,” Tommy said. The little bellman smiled and hurried away down the dimly-lit hallway after Taj had given him another twenty. It was the weekend, the Pelicans on a road trip out west. Taj had until Monday to report to the training facilities. He’d visited New Orleans many times during his tenure in the NBA, though he’d never ventured far from where the Pelicans played basketball at the Smoothie King Center or his hotel room. Tomorrow, he intended to change all that. After another glance out the window, he shut the curtains. Mid-December, the weather had turned cold. Though not as frigid as Cleveland temperatures, the humid climate in New Orleans was uncomfortable. Taj turned up the thermostat, opened his suitcase, found a sweater and pulled it over his head. Checking his email on the cell phone entertained Taj until a white-smocked waiter knocked on the door. The small table on wheels he pushed into the room sported a white tablecloth, fine china, and silverware. After opening the bottle of wine and filling a glass with a ceremonial flair, the waiter accepted Taj’s twenty, departing after saying almost nothing. “Nice,” Taj said, sipping the cabernet. Taj had forgotten Tommy’s story of murder as he twisted the tap on the antique porcelain tub, and then tested the water with his palm. When it grew hot, he returned to eat his steak. He turned up his nose at the steaming cup of gumbo, pushing it aside without so much as tasting it. As haze wafted up from the tub, Taj sat the wine bottle and his glass on the barbershop tile floor, and then stripped off his clothes. Not bothering to test the temperature, he slid over the side, sinking into the water to the top of his shaved head. Taj had a powerful frame for such a big man. Used to battling in the paint, he had a chest covered with bruises, contusions, and even a few cuts. The hot water soon began to soothe his sore body, and he finished drinking the wine straight from the bottle. After draining the last drop he closed his eyes, falling asleep. Sometime later, Taj’s hand relaxed, and he released his grip on the bottle. His eyes popped open when it shattered on the tile floor. He didn’t know how long he’d been asleep, but the water had grown tepid. Worse, the lights had gone out, the only illumination coming from a crack in the curtains. When he got out of the tub, he stepped on broken glass, cutting his foot. Finding a towel, he wrapped it around his bleeding foot and hobbled to the window. Unable to find a light switch in the darkness, he pulled open the curtains, red flashing neon from the French Quarter flooding through the window. The room suddenly grew icy cold. Sticky globules dripped from the windowpane and Taj recoiled when he touched the gooey substance. The inhuman sound of something coming up behind him caused him to wheel around like a frightened cat. Not a person easily startled, Taj recoiled against the wall. The disturbing sound of heavy feet shuffling across the floor, along with the rattle of chains made him do a double take as he wheeled around. What he saw caused him to draw a gasping breath into his lungs. Neither man nor beast, it was instead a cloud of white light with flashes of reds, yellows, and blues. Something alive, though anything but human, reeked of death as it floated toward him, the droning noise emitting from the specter sounding like the muted whine of a revving chainsaw. Fists clenched in a fighter’s stance, Taj took a swing at the advancing demon. When his hand passed through it, he realized he needed to run instead of fight. Sidestepping the entity, he stumbled to the door. When he reached it, he found it locked, and he couldn’t open it as he glanced over his shoulder at the terrifying apparition cloaked in a pulsating cloud of noxious gases moving ever closer to him. With renewed effort, Taj slammed his fists against the door, trying to break the doorjamb and get away from the supernatural being behind him. He fell on his face into the hallway when it opened of its own accord. Even with the bloody towel wrapped around his cut foot, he sprinted into the arms of an inebriated couple returning from a French Quarter bistro. Taj towered over the man and woman. Despite the alcohol they’d both consumed, nothing had prepared them for a meeting with a naked giant. They shouted for help as they hurried away. A dozen doors opened, staring out at the man with wild eyes, bare of clothes and bleeding foot. Hearing the commotion, Tommy came running. When he saw Taj standing naked in the hallway, he grabbed a terrycloth bathrobe from a service cart and tossed it to him. Before Taj could secure the tie around his waist, Tommy had pulled him into an elevator and punched the down button. “Stepped on broken glass,” Taj said. Tommy stopped on a lower floor and found a handful of towels in a linen closet. In the fluorescent lights of the elevator, Taj could see the little man was correct. By now, there was blood all over the bathrobe, and he felt light-headed. Taj didn’t realize he was holding anything until he looked and saw it. Recoiling, he let the object drop to his feet. “What in the hell is that thing?” he asked. Before answering, Tommy stared with his mouth open as he nudged the gruesome item with the toe of his shoe. “Then what about your tattoo?” Tommy asked. The white terrycloth bathrobe had splayed open across Taj’s broad chest revealing a strange tattoo. “Voodoo symbol? You’re shittin’ me,” Taj said. Then what the hell does it mean?” Taj asked. Though Taj Davis wasn’t oblivious to pain, he’d grown used to it during his seventeen years in the NBA. He hadn’t flinched when the hotel doctor deadened his foot before stitching up the wound. Used to boots and casts, the thick sock over his bandaged foot and the sandal he wore seemed mild to him. Tommy had retrieved Taj’s bags for him from room 1313. After changing into a Cavaliers warm-up uniform, the tall basketball player had fallen asleep in a comfortable chair in the lobby of the old hotel. Tommy was still at work when Taj awoke the next morning. “There’s ghost everywhere in the Big Easy but your new room is the safest one in the hotel,” he said. “Why are you still at work?” Taj asked. Taj grimaced when he got out of the chair and put weight on his foot. Tommy’s serious pronouncement brought a grin to Taj’s face. Taj wasn’t so sure after following Tommy to the elevator. This time, the little bellman opened the door of his new hotel room with an electronic card instead of an antique key. When they entered, there was no smell of must or age. Everything was perfect, except for the view that didn’t hold a candle to the one he’d had the previous night. Taj’s suitcase was waiting on the bed, his hanging clothes on a rack. He almost panicked when he realized he didn’t have his wallet. Tommy grinned and handed it to him. “I’m not much for credit cards,” Taj said, handing him a twenty before tossing the wallet on the bed. Taj grabbed the wallet off the bed and handed Tommy another bill from it. “You just earned yourself an extra twenty,” he said. Taj grinned at Tommy’s retort about his old lady. He stopped the little bellman with a question before he could get out the door. “A question before you leave,” he said. “Sure about that?” Taj asked. “What about the blood? Where did it come from?” Taj asked. “Not the answer I’m looking for,” Taj said. “Dr. 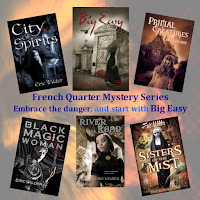 Voodoo’s Spells and Hexes,” Tommy said as he hurried out the door, not waiting for Taj’s next question. In deference to his sore foot, Taj took a cab to Dumaine. After signing an autograph for the star-struck cabbie, he stood outside Dr. Voodoo’s Spells and Hexes, staring at the voodoo dolls, African masks, and drums in the picture window. When a cold breeze whistled down the street, he pulled the black leather trench coat tighter around his neck as two lightly-dressed tourists brushed past him on the sidewalk. A bell on the door, pealing the theme song of some horror movie Taj barely remembered, sounded when he entered. Welcome warmth and the odor of pungent incense accosted his nostrils as the door shut behind him. The sound of voodoo drums emanated from speakers hidden behind the rows of African masks and grotesquely carved effigies. The little shop was empty of tourists and Taj jumped when someone behind him spoke. A portly man with a cookie duster mustache was grinning at him when he wheeled around. “Whoa, don’t hand it to me. Where’d you get that thing?” the man asked. “Aren’t you Taj Davis?” the man asked. “You have voodoo dolls all over the store. What’s wrong with this one?” Taj asked. When Taj leaned forward, Lafourche took a step backward. “I’m big and black but I promise I won’t hurt you,” Taj said. “Somebody hexed you is what I think,” Lafourche said. Taj glanced at Lafourche, searching for a grin or some other sign he was having his leg pulled. Lafourche wasn’t smiling. “I’m too old?” Taj said, finishing LaFourche’s sentence. “May have something to do with that thing in your hand,” Lafourche said. “Maybe unfinished business. You’d know the answer to that better than me,” Lafourche said. “I’m as in the dark as you are,” Lafourche said. The drumming soundtrack segued into an African chant as LaFourche leaned back against a display case filled with polished wooden masks and pottery effigies. “I’ve owned this shop for eighteen years. While most everything in the place is no more than a tourist souvenir, I’ve learned a thing or two about voodoo along the way,” Lafourche said. “What about another shop in town?” Taj asked. “How can you possibly know that?” Taj said. “What’s Christianity got to do with voodoo?” Taj asked. “You don’t practice, do you?” Taj asked. “When it’s cold outside, my business is slow,” Lafourche said, glancing around the shop. Catching the drift, Taj reached for his wallet and handed him a twenty. “Does that warm things up for you?” he asked. Taj handed him two more twenties. “Warm enough?” he asked. Lafourche stashed the bills in the pocket of the cracked leather vest he wore over his threadbare Western shirt. “That it?” Taj asked when Lafourche grew silent. “Surely, you don’t believe all that malarkey,” Taj said. The African chant coming through the speakers crescendoed and transitioned back into drumming. Lafourche glanced around the little shop as if expecting to see someone listening to their conversation. When Lafourche turned to walk away, Taj grabbed his shoulder. Realizing that Tammany Louis Lafourche the Third was unable or unwilling to answer any further questions, Taj let him sign him up for a tour of the St. Louis #1 Cemetery. Lafourche disappeared in the back and didn’t return, even when the same young couple he’d passed on the sidewalk entered the shop to the chiming of bells. “Are we in the right place for the cemetery tour?” the young woman asked him. The couple looked no older than mid-twenties, the woman’s midwestern accent tipping him off that they weren’t locals. She’d apparently expected warmer weather because of the abbreviated denim shorts she wore and the lightweight maize and blue parka zipped open enough that he could see her University of Michigan tee shirt. The stunningly gorgeous young woman had long red hair, creamy-white skin, expressive brown eyes, and stood five-foot-seven or eight. Her slender and shorter husband/boyfriend wearing an identical parka had his head in a guidebook. When he glanced up and saw Taj, he pushed his John Lennon glasses to his forehead. Apparently, neither of the two were into sports because they didn’t seem to recognize him. “I’m Taj,” he said, shaking the young woman’s hand. “Are you from out of town?” Brian asked. Taj had stuffed the voodoo doll into a baggie that Tommy had given him and stashed it in his trenchcoat. Amy with the wavy auburn hair was smiling but Brian had a look of abject terror on his baby face. Taj was used to the reaction. People aren’t always prepared to meet a physically imposing six-foot nine-inch black man dressed in a knee-length black leather trenchcoat. “What about you, Amy?” Taj asked. “Don’t know what I want to do for the rest of my life yet,” she said. The chime on the door sounded before Amy could ask him what he did. 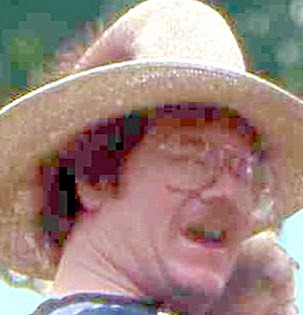 An older man wearing a yellow vest over his jacket rubbed his hands together to warm them. The plastic nametag hanging from his neck pegged him as the tour guide. Taj noticed the dirty look Amy flashed Brian at Garlen’s mention of a heavier coat. Her reaction lasted only a moment and she was smiling when she turned and shook Garlen’s hand. Amy gave Brian another dirty look. Garlen, like Amy and Brian, apparently had no idea who Taj was. That was all right with him as he listened to the trio’s banter as he followed them down the Basin Street sidewalk. Though Taj knew that most of the graves in New Orleans were above ground, he wasn’t prepared for the eerie feeling of deja vu that warmed his neck upon seeing the brick and stone monoliths. Garlen was correct. The wall around the cemetery blocked the wind when they entered the gate. “My skin is crawling,” she said. “Spirits of the dead; I can feel their cold breath on my neck,” she said. “You’re shivering,” Brian said, putting his arms around her. “You stay. I’ll walk back to the car and wait for you there,” she said. Brian shrugged his shoulders and shook his head as he cast a distressed look at Garlen. “So sorry,” he said as he followed her out the gate. A gentle rain began dimpling the dark leather of his coat as he watched the tour guide disappear through the fence. An unexpected voice startled him back to reality. An older black man was holding open the door of an outbuilding Taj hadn’t seen when they entered the cemetery. He followed him into the little building as rain began falling harder. There were no windows, the air stale, the little room dim, lighted only by a blazing potbelly stove and a few candles. There were a couple of ramshackle chairs and an old cot draped with pillow and bedclothes. The floor was dirt. Through the crack in the door, Taj could hear the drumming of heavy rain. “Who are you?” Taj asked. “How do you know that?” Taj asked. “Some people don’t have the foggiest idea where they’re really from,” Sam said, fluffing the pillow on the cot. Taj let the comment pass. During his tenure in the NBA, he had developed an eye for his opponents' height, weight, and age. Sam, he guessed was about five-eight and probably somewhere north of fifty years old. Despite the gloomy day, he had a pair of dark sunglasses perched atop his head. The stub of his lit cigar came out of his mouth only when he talked. Moving the pillow aside, he plopped down on the cot, propping his feet up on a packing crate. Taj grinned when he noticed the holes in his dirty white socks. “Think I’ll stand,” Taj said, glancing at the rickety chair he doubted would support his weight. “Want something to drink?” Sam asked. Sam retrieved a gallon jug of red wine from behind his cot, screwed open the metal cap, slung the bottle over his shoulder and drank straight from the container. Taj took the bottle, laughing before he took a swig. It was Sam’s turn to laugh when at the face Taj made as a few drops of wine dribbled down his chin. “Haven’t had any Mad Dog since I was a freshman in college,” Taj said, his smile returning. Taj was smiling and shaking his head as he handed the jug of wine back to Sam. By now, the rain was falling in bucketloads outside the little room, humid air flooding through the partly open door. “How’d you know my question was about voodoo?” Taj asked. “Who say I do?” Sam said. Taj reached into his coat for the voodoo doll. “What can you tell me about this?” he asked. “That’s crazy talk. It probably stuck to the doll when I was handling it,” Taj said. Rain continued falling outside the little room as Sam dropped something into Taj’s palm. “A fingernail. What makes you think it’s mine?” Taj asked. A sliver of purplish skin hung from the fingernail. Taj glanced at the ring finger on his left hand at the blackened nail he’d damaged in a recent basketball game. Taj recalled the woman he’d met in a bar after the game that night. An overly friendly young woman with a southern accent. “I’m having trouble believing all of this,” he said. “You believed it enough to come looking for answers,” Sam said. “I’m not a perfect person though I can’t think of anyone I’ve wronged lately,” Taj said. Before Taj could reply, the heavy door banged against the wall as a gust of wind blew it open. Sucking the air out of the room, it extinguished all the candles when it slammed shut again. Sam padded across the dirt floor, relighting the candles with what looked like a flame coming directly from his fingers. Taj waited until he’d returned to his perch on the cot.